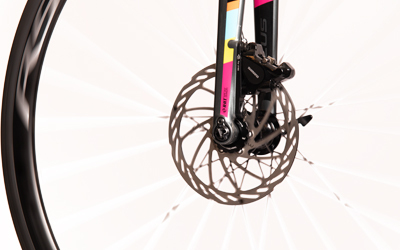 The pads in disc brakes are the parts of the brake that will wear out the fastest. But when a disc brake is used intensively and often you also have to replace the disc one time. You know when to replace this part as the disc has become thinner than 1,7mm. 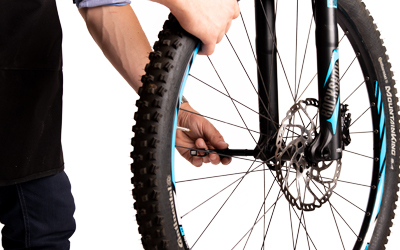 You don’t need to go to the bicycle shop, but can do it easily yourself. How to do this? We explain it in this blog. 6-bolt or a Centerlock disc? First check if you have a bicycle with a 6-bolt disc brake or Centerlock system. When you have a bicycle with a 6-bolt disc brake it is attached with 6 bolts to the wheel. 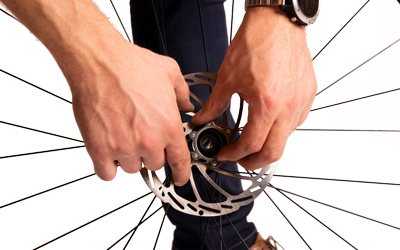 A disc with the Centerlock system is attached directly to the hub of the wheel. Select here what kind of disc brake you have. 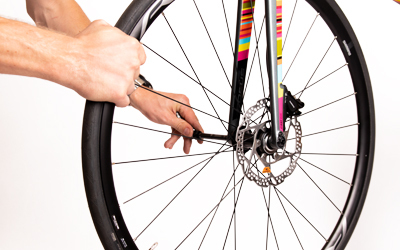 To replace the disc of your disc brakes well, you need to remove the wheel from your bike. 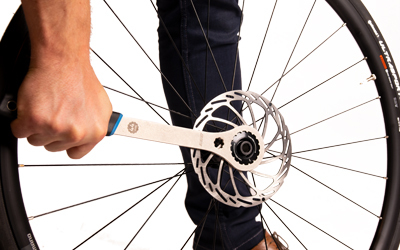 Open the quick-release system (when this is the way your wheel is attached to the bike) and remove the wheel. 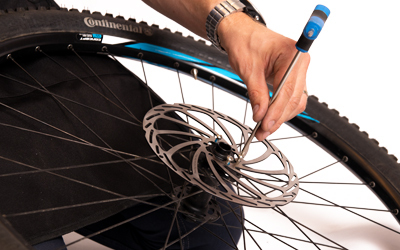 Remove the old disc that is attached to the hub of the wheel with 6 bolts. Use a torx key to do this. Place the new disc on the hub of the wheel. Tighten the bolts one by one. Make sure you tighten them proportional. Start with one bolt and go on with the opposite one every time. Lubricate the bolts a bit before tightening. This to provide dirt, water and sand to pollute the bolts. Pay attention to the angle of the disc, it has to be attached parallel to the wheel. If you are sure that the disc is mounted straight on the wheel, you can mount it on the bike again. Check if the disc is attached straight by turning the wheel with your hand. If you have a bicycle with a Centerlock disc brake. Replacing the disc is even more easy. Because with this technique the disc will always be mounted parallel to the wheel. 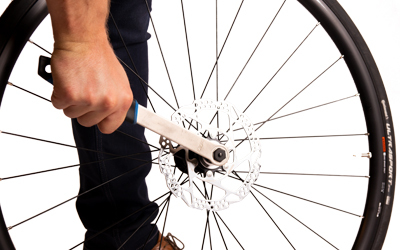 Use the BBB BracketGrip or another tool to remove the old disc from the hub of the wheel. Place the tool on the washer and turn. When it comes lose you can pick the disc of the wheel. Place the new disc on the hub of the wheel. You don’t have to pay attention to the angle of the disc. But, make sure the right side of the disc is turned to the outside. Now attach the washer and mount the disc. Did you buy discs from us but you have a bicycle with Centerlock system? In this case you will need the CenterFit (BBS-90) adapter to mount the disc to the wheel. 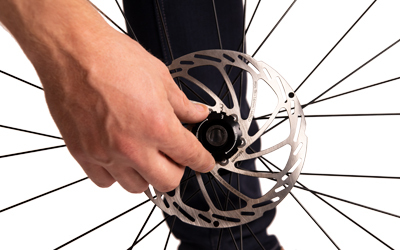 Place the disc in between the black and silver part of the adapter and attach it to the wheel. Place the new disc on the hub of the wheel. Tighten the disc on about 40Nm, with reasonable power. Advantage of this system is that the disc will always be parallel on the wheel. You don’t need to check if the disc is mounted straight on the wheel, but do check if the wheel runs smoothly. Besides the disc you need to replace the disc brake pads even more often. But, when you need to replace them and hoe to do this. You read all about it in this blog: How to replace disc brake pads? Do your brakes make a squeaking sound? In this case it is possible that they are wrong aligned. 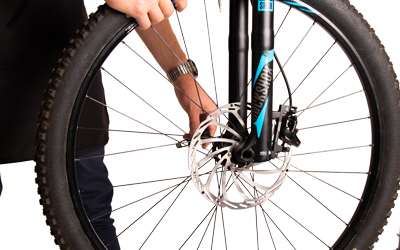 Do you want to know how to adjust your disc brakes: How to adjust a disc brake?